ON THAT Friday night, till the early hours, indulged by a Moroccan waiter, we members of the singing wing of the Omagh District Orange Cultural Association coach trip to the Somme sang all the songs of the First World War we could remember. Most moving of all was one written in 1975. Eric Bogle's anti-war song about the fictional Irish soldier, Private Willie McBride, killed on the Somme in 1916, could move anyone to tears. 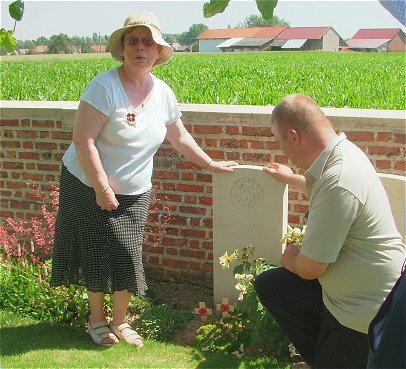 It's almost impossible to get one's head around the terrible statistics of the Somme, so one searches for the stories of individuals to try to understand it. Everyone on our trip - who included veterans of the Second World War, civil servants, retired security force members, farmers, mechanics, church wardens and housewives - had relatives who fought in that war. I was remembering my grand-dad Grandfather O'Sullivan, a non-commissioned officer in the Munster Fusiliers, who was lucky enough to survive: a life-long Home Ruler, he lost his game-keeper's job a few years later when the IRA intimidated the Anglo-Irish family for whom he worked into selling their North Cork estate and emigrating. For me, seeing an Irish minister, Mary Hanafin, laying a laurel wreath in memory of the dead of Ireland, was perhaps the most moving moment of a weekend of often almost unbearably moving experiences. As I said in an interview at the Ulster Tower, "it made me proud to be Irish". On our coach were Derek Reaney and his mother, widowed four weeks previously. Derek's father had booked for the Somme trip to find his uncle's grave, and when he died suddenly, Derek took his place. We were glad to be in Ham cemetery among those rows of white headstones, to remember Derek's great-uncle as well as his father. Most of us also visited the adjacent German cemetery, with its rows of black crosses marking graves with four soldiers apiece, and two headstones honouring their Jewish comrades in death - an image that haunts anyone who thinks of the persecution of the Jews that began less than two decades later. There is sadness but also fierce pride among Ulster Protestants when they remember the Somme, in which the headstrong courage that distinguishes the Ulster-Scots won them a disproportionate number of medals for valour. At the ceremonies last Saturday, Iris McDermott wore her Grandpa Barker's medals, which included a Distinguished Conduct Medal (the lower ranks' equivalent of the Distinguished Service Order), awarded "for conspicuous gallantry". Not only was he in the lead in taking enemy trenches in the face of machine guns, but he never returned to his own lines without his dead and wounded colleagues. "The scum of the earth honouring the salt of the earth," said Grandpa Barker's grandson-in-law, Henry Reid. "How dare these parasitical terrorists and drug-dealers of the UVF suggest a link between themselves and the heroes of the 36th (Ulster) Division." As the red-coated ranks of the East Belfast UVF band and their militaristic followers marched around Ulster Tower grounds, the dismay and anger among our group was palpable. Once again, the ordinary decent Protestants were being let down publicly by the dregs of their tribe. David Ervine of the PUP - favourite loyalist of the Department of Foreign Affairs, lately affiliated to the UUP in the Assembly, who had embraced Peter Hain earlier - sat in the rows of honoured guests during this travesty of the earlier official service. Our organiser, David Marshall, dressed in the uniform of a B-Special family friend, rebuked several UVF men for smoking on what is regarded as the sacred ground of the Tower. But what caused real horror was finding a khaki-clad UVF representative had laid a poppy-wreath from "the officers and volunteers of the Red Hand Commandos" - UVF sectarian murderers. No wonder that on the last night it was Willie McBride again, sung superbly by Ross Hussey. Did they sound the fife lowly?